Recently I challenged myself to get much more familiar with Git. I've used it briefly in the past, but some of my recent work got me seriously craving for a better version control system (VCS) than Subversion. Something faster, something that didn't require connection to central server, yet still allowed me to access my work on both my home and work computers. Git alone met majority of these requirements, I just needed a remote repository to share and sync my work between computers. GitHub was my first choice, but my some of my work is not supposed to be available to the public, and I didn't think premium account was worth it. Setting up my own server seemed like too much work. My search for something simple, free, yet fast and reliable pointed me to Dropbox. Dropbox has always been my favorite way to sync files and passwords between my devices. 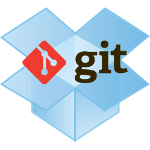 Here's how to turn it into a perfect remote Git repository. Technically, it's still stored locally on the same machine, but because it's inside our Dropbox folder, it will be automagically synced to the cloud and other linked devices. I'm naming my remote repository "dropbox" instead of traditional "origin". This could be handy if you have multiple remote repositories. I am also telling git to track remote master branch as upstream with -u flag. Now we have a distributed VCS with a central server, which is fast, reliable, super easy to setup, doesn't require maintenance, private and is free of charge. It might not be suitable for collaboration between multiple developers, but it's ideal for the needs of one.